With no focus on early education, are anganwadis in Telangana mere daycare centres? It must be noted that pre-primary school education is considered crucial in keeping children in school as 60% of the drop-outs happen before the child reaches Class 3. HYDERABAD: Are our young children who go to government-run anganwadi centres receiving quality education at par with their counterparts who go to private run pre-schools? 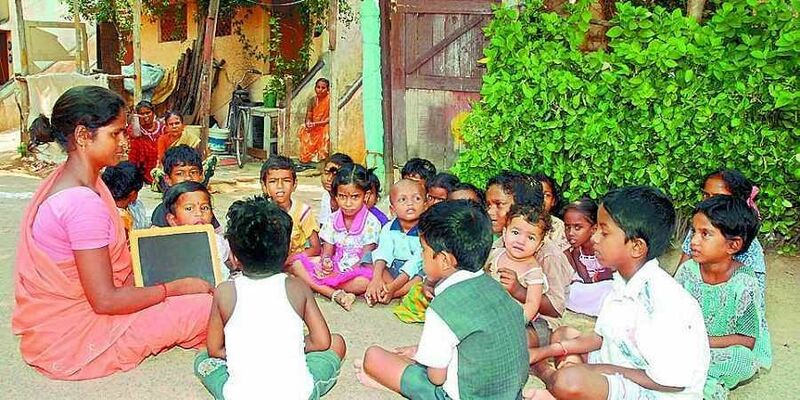 A new study by Save the Children has found that Telangana spends Rs 6,336 on each child who goes to the anganwadi centres every year, however, no small component of this is spent on early child education. This is unlike the private pre-schools where a larger sum amounting to anywhere between 9,000-29,000 is spent to educate the children. The study titled ‘The right start - Investing in early years of education - TELANGANA’ also goes onto highlight how Telangana’s expenditure if divided across various components, focuses on the ‘salaries of anganwadi teacher’ (49 ) and providing ‘Nutrition’ (44). No component of the money spent is given to learning materials and curriculum development, nor to training the teachers. Comparing this with the money spent in private, at least 4-6 components of the money spent on the child there go into developing curriculum and providing learning materials. However, a point to be noted is that nutrition is not provided in some of these and the parents of the children pay for taking the services. It must be noted that pre-primary school education is considered crucial in keeping children in school as 60% of the drop-outs happen before the child reaches Class 3. Experts say this could be due to the fact that they do not know how to read basic alphabets even when in Class 1 and lose interest in studying. To promote this, there have been talks at the central level to take anganwadis to school and improve the situation of pre-school education. “We examined various models and saw that it would be more apt to take the pre-primary school education to the anganwadis by appointing trained teachers on an hourly or weekly basis as these centres are within the community and provide the crucial aspect of ‘care,” noted Alka Singh, Head of Policy and Advocacy, Save the Children. The study also suggests policy intervention in terms of getting the State to allocate a separate fund for pre-school education.